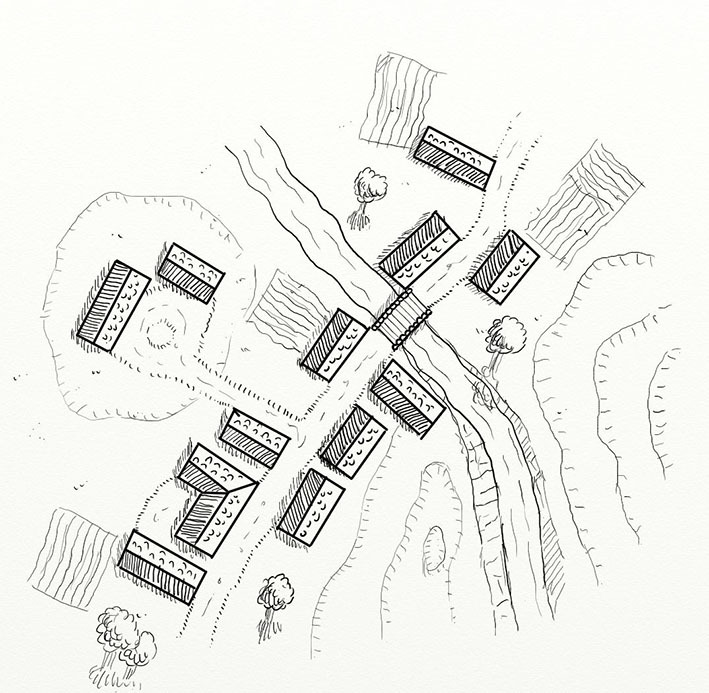 Last week I was asked to do a commission of a small village for a RPG adventure. The deadline was rather short and this was just before midsummer, so I didn’t have much time available. As you might not know, if you’re not a Swede, midsummer is a very big holiday here in Sweden. Everyone has a day off from work on the Friday that week and dances around the midsummer pole, especially if you have kids. And with three kids in the house that means a lot of dancing for me. 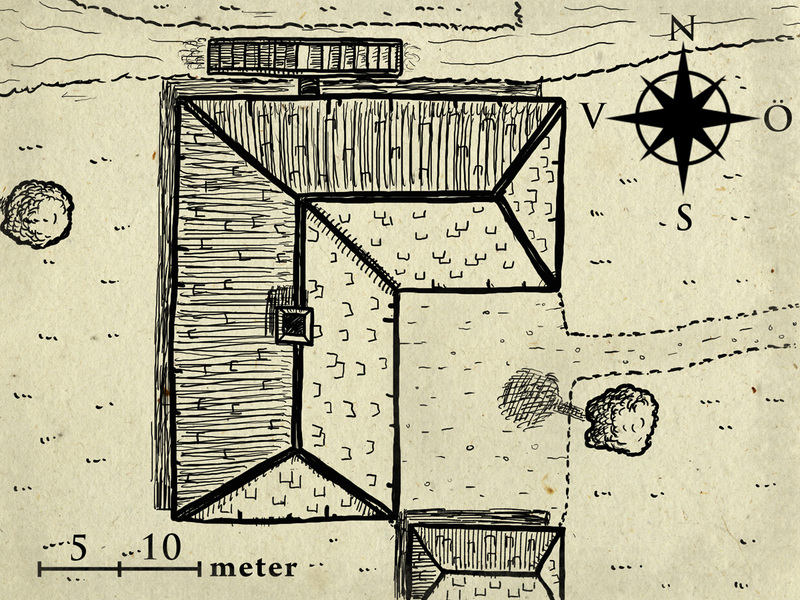 Anyway I decided to take the commission regardless of my lack of time, because I saw this as an opportunity to try to make a village map by hand on my Cintiq. Usually when I draw villages or cities I use City Designer 3 (CD3) from Profantasy. That is an absolutely brilliant program, especially if you make medium sized cities. But I really wanted to try to do this one by hand. Also the map had to be in an old school style, and I don’t think CD3 has any style that fits for that. After finishing the map, that I managed to do before deadline, I felt that there where areas in the map that could be improved. So I decided to make another one, just for practice. 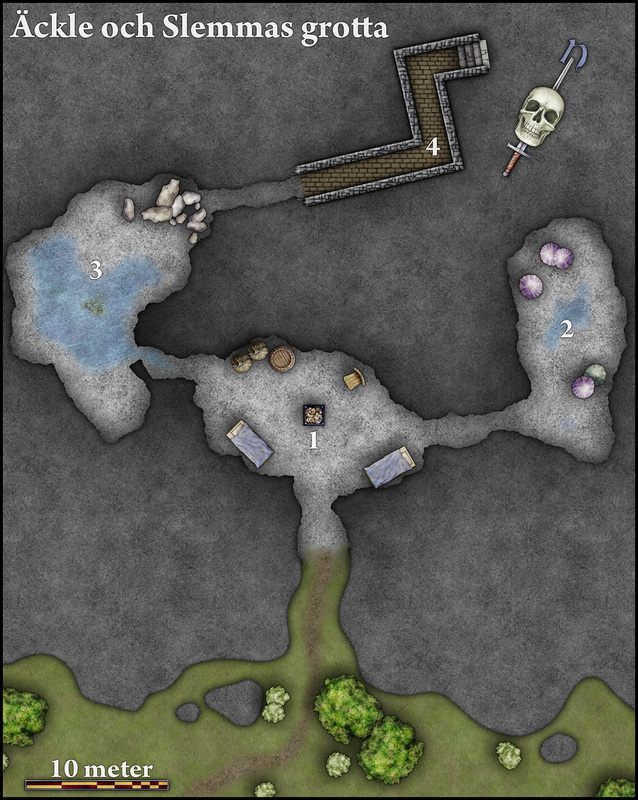 Also this time I made it completely by hand, no premade symbols or brushes. Everything is done as if you were using pen and paper (you can see the map at the top of this post). There are still things in the map that I want to develop further, for example the hills and farmland. But overall I’m pleased with the result and most of all I feel like I have something good in the works here. So I will definitely continue working on this style in the future. A long time ago before computers all you could do was making maps on paper. 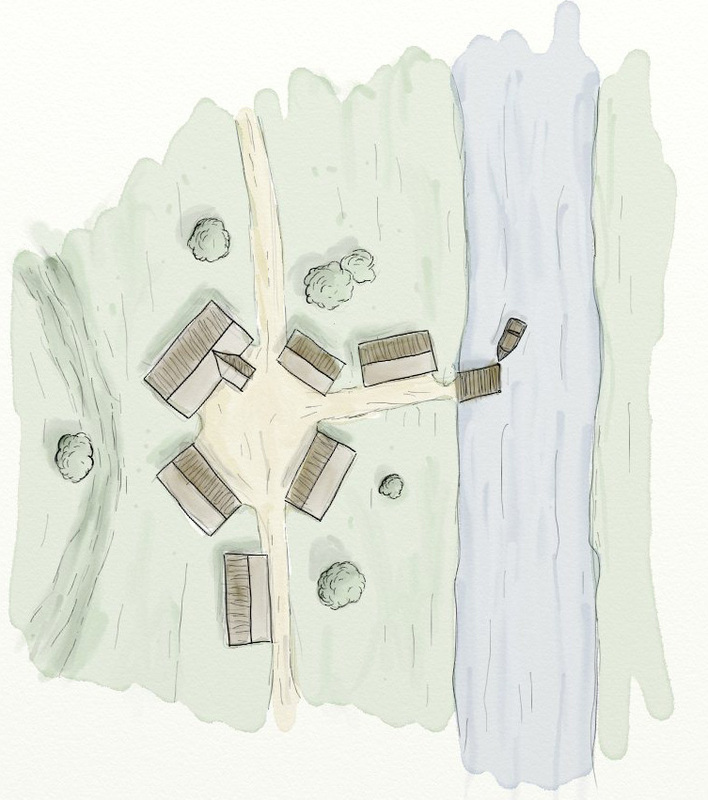 When I played RPG’s with my friends during that time I loved doing maps, mostly those where made in inked watercolour. Since then I hardly pick up my analog stuff anymore, it is so much simpler to just do it on your computer. With programs like Photoshop and campaign Cartographer the process of making maps are so much easier. But sometimes I miss drawing by hand, and Photoshop’s tools just don’t have the right feeling. Luckily enough Jonathan Roberts over at fantastic maps told me about a program called Artrage. It is an illustration program that has an affordable price and a great set of tools to use. Suddenly I’m finding myself drawing again, and it feels like doing it on paper, even though you’re doing it on your computer. 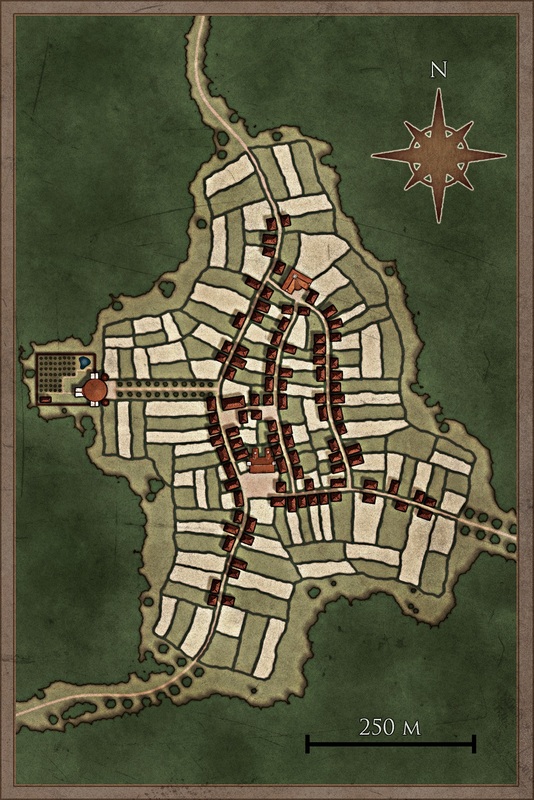 The map included in this post is an example of a quick map of a small village I made in the program while trying to learn it. It is coloured using the watercolour tool which works really nice. It takes some time to learn the way the program behaves but you can find a lot of great tutorials on youtube. And as soon you get a hang of it, it really works like a charm.